The Middle Ages. Part Two of a three-part series examining the iconography of the Annunciation used in Eastern and Western painting, mosaics and sculpture, from the Early Christian period to Italian art in the 15th century. In the 11th and 12th centuries, under the influence of the Byzantine style, Mary’s special, regal role is brought out using architectural elements: her throne becomes almost a monument, often assuming the form of a complex baldacchino. Mary is thus removed from concrete reality and placed in a “divine” dimension. This also explains the “drape of honour” often seen behind the Virgin, which harks back to the iconography of Imperial Rome, where two figures would hold up a drape behind the Emperor to emphasize his authority. 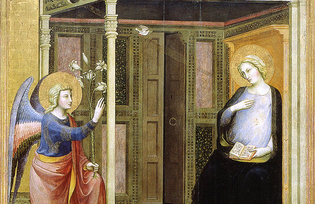 At the beginning of the 11th century, the image of a dove flying toward Mary’s ear started to make an appearance in Western representations of the Annunciation, albeit rather infrequently initially. The dove symbolizes the act of conception which took place in the Virgin’s ear – first mentioned in the 4th century by Athanasius of Alexandria: “Come and gaze upon this marvellous feat: the woman conceives through the hearing of her ears!” Ephrem of Syria wrote: “Like the Burning Bush on Horeb (Mount Sinai) which carried God in the heart of the flames, so Mary brought Christ into her virginity: through her ear the Divine Word of the Father entered and dwelt secretly in her womb.” In the 12th century, in both Eastern and Western art, the image was often used of the Holy Spirit-Dove descending from on high towards Mary’s ear via a beam of light. Noteworthy examples of this can be found in the mosaics both of Monreale cathedral and the Church of the Martorana in Sicily. In the 11th century, the image of Mary’s spindle began to give way to that of the book, accompanied by a pulpit or lectern. This came about under the influence of Franciscan spirituality which put the accent on Mary’s piety (rather than her regality) and revived the traditional account of how the Virgin was reading her psalter when the divine messenger arrived. Later on, the image of the book was used as a reference to Mary reading one of Isaiah’s prophesies in the Bible (Isaiah 7:14) “And the Lord himself shall give you a sign. Behold, a virgin shall conceive, and bear a son, and shall call his name Immanuel.” This prophesy is interpreted as a prior announcement of the birth of Jesus. The Franciscan influence is also visible in the gradual “humanization” of a number of scenic elements. Indoor scenes are rendered more realistically. In the Scrovegni Chapel in Padova, which was completed in 1305, for the first time ever Giotto painted in lines marking both the ceiling and the floor in order to create the perfect illusion of a natural space. Thus in the 14th century, earthly reality is ever more present in the scenes of the Annunciation, via pictorial details like the background, the architecture and the furniture and decor. The physiognomy and general aspect of the protagonists also changed. When Duccio, Cimabue and Lorenzetti painted their Madonnas, they gave them small yet fuller lips, and slender yet more sensual fingers compared to the icons from the East. They began to combine the divine with the human, introducing physical elements which were pleasing to the eye of the human beholder, and not just that which had found grace in the eyes of God. This attitude differed radically from the Byzantine mentality, which favoured representations of an eternal, immutable truth. The ornamental scroll, containing the written message of the Annunciation to indicate the exchange between the angel and the Virgin, first appeared in the early Middle Ages. 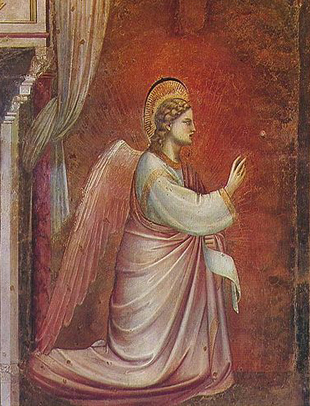 In the Scrovegni Chapel mentioned above, Gabriel (holding a scroll) and Mary are on their knees facing each other. There is a prior example of this positioning from the 12th century: a kneeling angel appears on a pillar in the cloister of Santo Domingo de Silos in Spain. In French cathedrals too the angels are often represented as knights, wearing a long tunic reaching their feet and a cloak fastened with a clasp. This type of iconography reflects the habits of court life and in particular the feudal custom, used by both knights and troubadours, of bending a knee before a lady. It was to become ever more popular, thanks also to the “Meditations on the Life of Christ” by the Pseudo-Bonaventura written at the end of the 13th century, which described Mary kneeling at the moment of giving her consent (“fiat”), followed immediately by the archangel Gabriel. Another iconographic model which also gained popularity at the time was inspired by a version of the Pseudo-Matthew, also present in the Leggenda Aurea (late 13th century), according to which the Virgin gave her consent by spreading her hands and raising her eyes to the heavens. A new element reflecting Franciscan spirituality was the use of the Child Jesus to symbolize the conception. The Divine Infant is portrayed carrying the cross on his shoulders as he descends towards Mary on a beam of light. This iconography corresponds to the belief that Jesus was not formed “in uterus” but rather sent down from the heavens by God (“emissus caelitus”), entering fully formed into the womb of the Virgin. This image would later be taken up by Northern European artists in particular, but it was to remain controversial for some time and was finally eliminated completely. By the 15th century it was already the cause of numerous protests, including those voiced by Antonio the Archbishop of Florence. Later the Council of Trent aligned itself with the position taken by Antonio (and others) and the theologian Molanus of Leuven in his De Historia sacrarum imaginum et picturarum forbade any images of the Annunciation in the repertory of Catholic art which showed “corpusculum quoddam humanum descendens inter radios ad uterum Beatissimae Virginis”. Another important appearance in representations of the Annunciation from the 13th century onwards is the figure of God the Father. Featuring far more frequently than the Christ Child, God the Father often appears just as head and shoulders, for example in the Annunciation by Pietro Cavallini in the Church of Santa Maria in Trastevere, or that by Jacopo Torriti in the Church of Santa Maria Maggiore in the centre of Rome. The presence of the Father, as well as the Holy Spirit, underlines the active presence of the Holy Trinity at the moment of conception. This idea is further symbolized architectonically using structural elements which recall the number three: for example three-mullioned windows, triple arches etc. (these are particularly significant in Flemish Art). 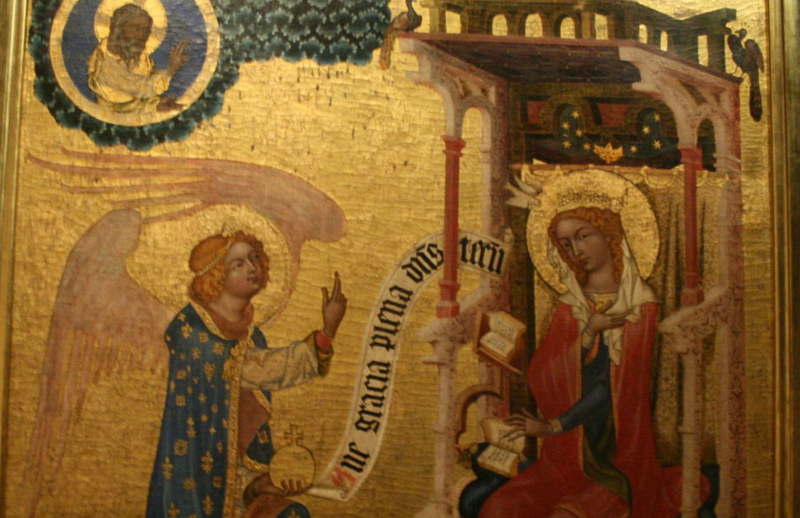 The intervention of the Holy Trinity in the Annunciation is also mentioned in the “Meditations” by the Pseudo-Bonaventura, cited above. Alongside the angel-knight, and the angel-girl, we also find the angel-priest, portrayed wearing ecclesiastical robes in the iconography of Northern European art from the 13th century onwards. The angel-priest image reflects the writings of Pseudo-Dionysius the Areopagite regarding the symmetry between the hierarchy of angels in heaven and the ecclesiastical hierarchy here on earth. From the 14th century onwards, the lily – a symbol of purity – tends to replace the sceptre as Gabriel’s main accessory. This substitution was common above all in Florence, the city whose coat of arms is a red lily. In reaction to this, Florence’s historic adversary, Siena, a city renowned for its devotion to the Virgin Mary, began to represent Gabriel holding an olive branch in his hand – as can be seen in Simone Martini’s famous painting in the Uffizi Gallery. In Northern European painting however, the lily is often shown in a vase rather than in the hand of the Divine Messenger who still carries a sceptre. At times the lily is associated with other flowers, like the rose (symbolizing charity) and the violet (humility).